Cardboard boxes seem to accumulate very easily, so I keep trying to come up with ways to use them. To end my week of heart projects, this is a really quick and simple one that was inspired by my yarn gift tag. At first, I used a heart that had a pointy bottom like my SVG heart files and it didn't work. Wrapping the yarn around the pointed part of the shape was difficult. The yarn was also overlapping too much and making the piece look bulky. The solution was to use a heart with curved vertexes. Cut out the template and trace it onto the cardboard. If your cardboard is thin and you'd like to make your heart sturdier, just cut out two hearts and glue them together. 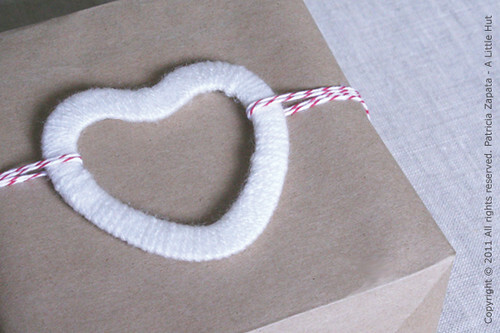 Wrap the yarn around the heart, making sure not to leave any gaps in between the yarn strands. Tie the loose ends and you're done! If you're interested in making something bigger like a Valentine's Day wreath try using my 4th of July wreath idea. Instead of cutting two circles you'd cut out two hearts and follow the same steps in that project. Remember to use a curvier heart so that the wrapping is even and easier to do. I was going to make one until I discovered that no red t-shirts deserved such death-by-scissors just yet! - Craft for featuring my basic tools post and my Valentine's Day printable set. - Baby Center for including one of my printables in their set of cool calendars. - Make and Takes for featuring The Basics posts. - Curbly for featuring my memo holder and gift tags. One more thing... I loved reading about Shane Power's work on Holly's (Decor8) blog and about his collaboration with WestElm. I love those new ceramics... totally me. Holly said that WestElm would be reading the comments for recommendations. I'm thrilled that they are in search of new talent and really trying to think out of the box. My recommendation is at comment #1—but I certainly wouldn't mind if it were me—wouldn't that just be the ultimate dream?